In Washington State, few labels have been as iconic as L’Ecole No 41’s watercolor depiction of its schoolhouse building. Starting today, that image is part of the winery’s history as the label receives a significant makeover. L’Ecole’s rebranding effort began almost two years ago in the summer of 2009. For second-generation owners Marty and Megan Clubb, the original intent was to differentiate between the winery’s Columbia Valley and Walla Walla Valley wines. However, it quickly became clear to the Clubbs that they needed to do much more. 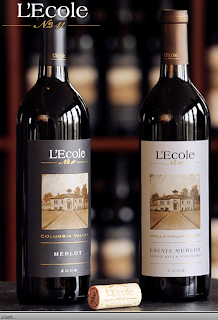 L’Ecole’s watercolor label design dates back to the winery’s beginnings in 1983 when it held a design contest among family members. The winner was a painting by 8-year old Ryan Campbell. Campbell’s picture subsequently became synonymous with the winery’s brand. 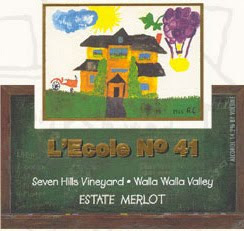 L’Ecole updated the label in 1997, when a green chalkboard with the wine name was added below the watercolor painting. The winery has subsequently used the chalkboard theme extensively in its branding. For many Washington wineries, this might not present a significant concern. However, L’Ecole’s wines are distributed in all 50 states and in 20 countries around the world (annual production is 35,000 cases). As the winery continues to build a larger presence for itself - and for Washington - it became increasingly important to make that first impression the best one possible. For the label, Clubb worked with Portland-based designer Anton Kimball. Kimball had previously worked with major brands, including Guinness and Nordstrom. While he hadn’t worked with many wineries in the past Clubb says of Kimball, “He immediately connected with all of the issues we were talking about.” Kimball’s starting point for the new design was the image of the winery’s old schoolhouse - the icon of the brand. Clubb also worked with the Seattle firm Palazzo Creative on numerous aspects that would need to accompany the change. When one looks at L’Ecole’s new package design, the changes are sweeping. The new package is classy and elegant with a look that borders on timeless. It starts with an embossed depiction of the schoolhouse on top of the capsule. On the neck is a gold-colored L’Ecole with No. 41 written in smaller print immediately beneath, a nod to the fact that many simply refer to the winery as L’Ecole. At the top of the label is the word L’Ecole with No. 41, again in smaller, gold font immediately beneath. At the center of the label is Kimball’s drawing of the schoolhouse. Kimball drew the picture based on the historic photograph that hangs on the wall at the winery, and the image has a sepia tone quality. Beneath the picture is the viticultural area designation – Columbia Valley or Walla Walla Valley. This designation is reinforced by the label color, black for Columbia Valley and white for Walla Walla Valley. This is followed by the wine name and vintage. The new Apogee and Perigee labels have a slightly different look. The schoolhouse picture is considerably larger and is raised to the top of the label. The label paper is grainy and textured. The schoolhouse itself is raised, making it seem three-dimensional - almost as if one is being invited into the building and into the winery’s history. The new labels will be on all of the 2008 red wines as well as some of the 2009 white wines and all of the 2010s. The first release with the new label, the winery’s Chenin Blanc (which will now simply be labeled Chenin Blanc; the Schoolhouse Red will now be labeled Red Wine), will be released in May. In a nod to the significance of this change for the winery and its loyal customers, L’Ecole has scheduled various wine club member events this week to unveil the label. For those wanting an early look, the new design will also be previewed at this week’s Taste Washington. While L’Ecole’s label change had much to do with establishing a stronger national and international presence, it was also done to look toward family and toward the future. 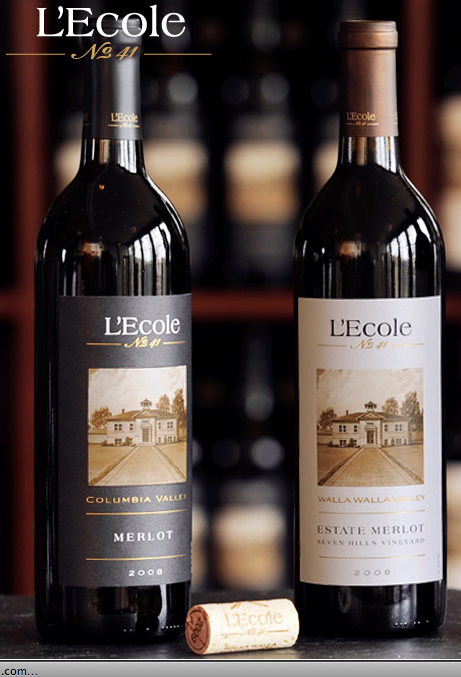 L’Ecole will be celebrating its thirtieth birthday in a year and a half, and the winery is slowly moving towards its third generation, with the Clubb's son completing college in 2009 and their daughter finishing WSU's wine management program in 2012. As much as anything, this is a label for the next generation. Great job on the new look, I think it's fantastic. 1eyewineguy, agreed. I think it came out great. Oddly enough I spent a fair amount of time a L'Ecole last Thursday and the subject of the label design came up. One of the concerns was that green and gold are common colors used in wine labels, and using them was causing the old design to blend into the rest of the wines on store shelves. I'm not sure that I'd agree that the new label will stand out, but it does look more elegant. Maybe there is a thought at L'Ecole to try to go upscale a bit in their wines and their prices. I agree that the change is definitely for the better, despite any temporary growing pains they may experience in the interim. Their old label, while certainly recognizable, did not visually express the elegance of their wines. Exchanging the fun primary colors for a more refined look befitting of their price point doesn't seem to be a decision that they will regret. I'm really excited about this new design as well. The previous label seriously turned me off as a consumer—and one that was outside the NW when I first encountered their wines! I think the new design does a much better job at conveying the image they would like to build and maintain. Kudos to them! JB Neufeld - "that uniqueness of place"
Washington Syrah - Star or FUBAR? Do wineries fudge alcohol levels?